In this old land of steep slopes and small valleys, located between the mountain ranges of Estrela and Caramulo, the Cister monks built the monastery of St. Pedro de Mouraz in the 12th century, giving rise to the farming of vineyards in this region. The land has changed little save the original farming practices, swallowed by industrialization. 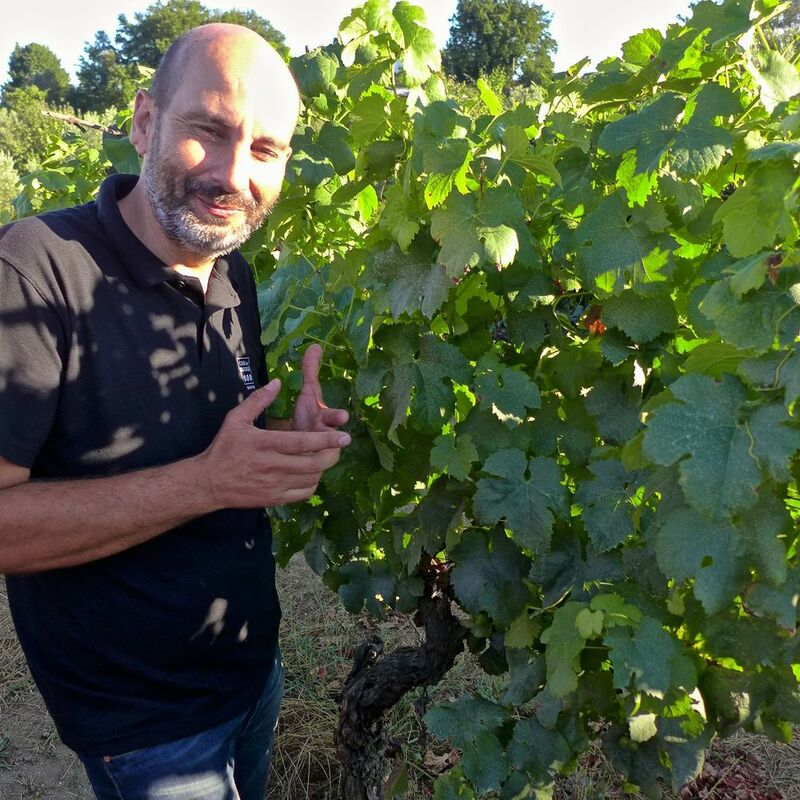 Antonio Lopes Ribiero and Sara Dionisio have brought them back: they inherited the vines through several generations, but converted it to the first certified organic vineyard of the Dão in 2000. They have since converted entirely to biodynamic farming. The need to keep this family home healthy for the coming generations moved them home from careers in the London art world. With the intent to use local varieties to the best of their terroir expression, the couple concentrates their creative efforts in respect to the cycles of nature. They farm thirteen hectares of various grapes (five red, four white), which is divided into ten parcels due to differences in soil (granite to clay), altitude (140 to 400 meters) and surroundings (chestnut, oak and pine trees). New plantings vie alongside nearly 50 year old vines. Documentation shows that the parcels are the same ones which were used as long ago as the 16th century! The cellar uses the best of modern technology but with traditional methods applied first, and is located in a stone house cut from the very rock beneath them. Gentle pressings, natural yeast starters, long lees contact in the wine and minimal handling otherwise are the time-honored practices. Stainless steel tanks with temperature control and pneumatic presses enhance the prospects. The results are clear: pure expressions of the older grape vines, with distinct transparency to the terroir they have grown up on, while still fresh and pleasurable enough to drink young and often. Antonio and Sara are a dynamic team, active in promoting the spread of their philosophies to neighboring vignerons. The more they press, the better their wine, and the wines of Portugal as a whole, will be! We think the monks would be happy, too. Certified Organic & Biodynamic. Currently in conversion to DEMETER. From 40 year old vines of a single vineyard planted on 3 hectares of granitic soils at the foot of Caramulo mountain. All grapes are hand-harvested in mid-September, de-stemmed, and allowed to macerate for two hours before spontaneous fermentation in stainless steel tanks, with indigenous yeasts, lasting 4-5 weeks. Malvasia-Fina, Bical, Encruzado, Cerceal, Rabo de Ovelha, Uva Cão, Fernão Pires and others from old vineyards. From old vines (50 years+) planted on 8ha. All grapes are hand-harvested in the second week of September, de-stemmed, with no time on skins and spontaneous fermentation last 2 months with indigenous yeasts. The wine spends approximately 3 months on lees and is aged for 9 months. Filtered. From 50 year old vines planted on 4 hecatres of granitic soils, the grapes are selected from a mixed vineyard by hand and de-stemmed with spontaneous fermentation taking place in stainless steel vat with indigenous yeasts for two months. The must remains on fine lees with regular bâtonnage for three months. Aged in stainless steel tanks for nine months. Fined with bentonite. From 15 and 85 year old vines planted to 12 hectares of granitic soils all grapes are handpicked from fifteen hectares of granite-heavy soils. All grapes are hand-harvested and vineyard sorted at the same time in mid-to-late September, then destemmed and allowed to spontaneously ferment with indigenous yeasts in stainless steel tanks (5000-11000L) for 1-2 weeks. The wine spends its entire time on the lees and is aged in stainless steel and 20% used French oak barrels (500L). Aging lasts in oak for 9 months and in stainless steel for more than 2 years. Not filtered. A field blend from a single 2.5 hectare vineyard, planted on white and decomposing granite, aged around 90+ years, with 30 different grape varieties (mostly Baga, Jaen, Alvarelhao, some other white grapes but no Touriga Nacional). The grapes are hand-harvested in mid-September, vineyard sorted, de-stemmed and all the grapes are co-fermented, spontaneously, for 1 week in stainless steel tanks with ambient yeasts under temperature control. The wine sees no barrel aging, only aged in stainless steel for 3 years with gentle filtration. Elfa is the ancient way of manually planting several varieties randomly in the vineyard. This unique wine celebrates a lost tradition and is of limited production from an old parcel that was planted with thirty different varietals.